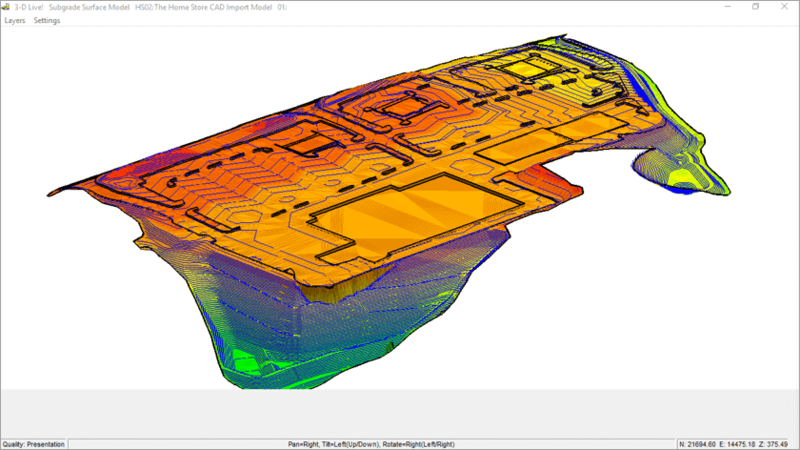 InSite SiteWork's built-in CAD viewer provides import of existing and proposed grades and other site features on even the largest projects in seconds. Import existing and proposed grades on even the largest projects in seconds. No need to purchase an expensive CAD program. No prior knowledge of CAD required. Combine CAD and PDF take-off. Data exported with FieldLink™ or optional Field General™ Office are output with the CAD coordinates. Open the CAD file to import. 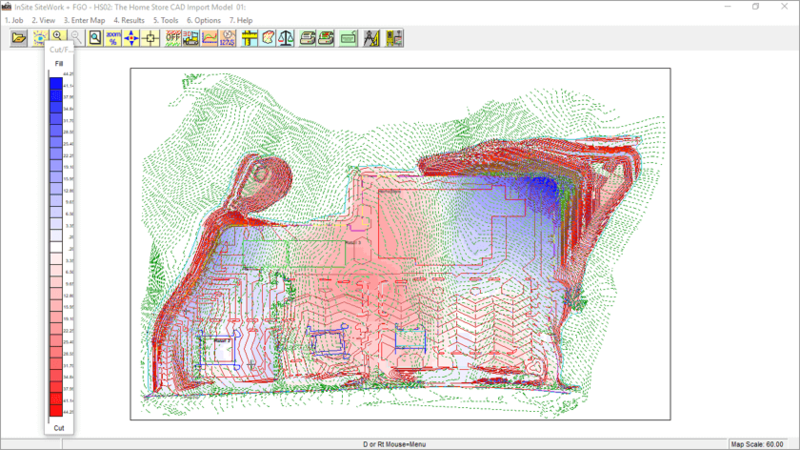 Click on individual features (contour, building, etc.) to discover layer names. Unselect all layers and turn on the layers containing existing contours. Choose the Import Icon to import the grades. Repeat the procedure for proposed grades. 2-D files can be elevated. As each feature is imported, the thumbnail in the lower left of the screen is updated. InSite’s QuickStack™ Subgrades offer a tremendous advantage in taming complex sites. Continuous entities in CAD files (like these building footprint) can be selected with one click. 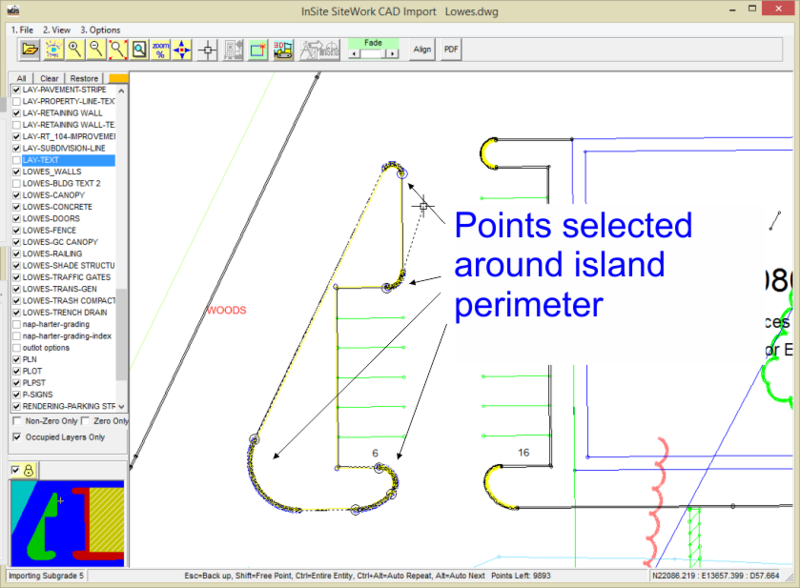 To take-off more complicated shapes like the paving perimeter or the islands, InSite SiteWork has special commands that allow arcs and lines to be selected quickly, allowing the fastest possible take-off. Add soil borings, a site boundary and any stripping or demolition. From CAD file to a complete take-off with just a few easy steps without the complexities of a CAD program!